This addon let's you specify the name and house where you wan to port to. Of course you still require the rights to enter a house, but with this addon, you can port to any house at any time. This allows you to visit secondary residences of other players at any time. 2) you can use the command line. Furthermore, you can define keybindings for up to 10 favorites. Dieses Addon erlaubt es dem Benutzer zu beliebigen Häusern zu porten, sofern er über die nötigen Rechte besitzt. Somit kann der Spieler mit diesem Addon auch zu anderen gekauften Häusern anderer Spieler porten, auch wenn sich niemand in dem Haus befindet. Zudem lassen sich für bis zu 10 Favoriten Keybindings definieren. Cet add-on vous laisse choisir le nom du contact et la résidence vers laquelle vous souhaitez vous téléporter. Vous pouvez vous téléporter vers n'importe quelle maison à n'importe quel moment - sous réserve bien sûr de bénéficier des droits de visiteur. Vous pouvez visiter les maisons secondaires d'autres joueurs à tout moment, même si le propriétaire est ailleurs ou hors-ligne. 2) En utilisant une ligne de commande. Vous pouvez en outre configurer jusqu'à 10 touches de raccourci vers vos maisons favorites. - /ptf fav => lance la téléportation vers la maison favorite indiquée. Added two new houses. French translation is missing. If you know the names, please let me know. New Houses have been added. New Feature: Added a context menu for the chat and guild lists. Bug Fix in /ptf show. thanks to Snow for reporting. Bug Fix: Visit Card Whispers are now working correctly. Bug Fix: Fixed the issue introduced with 1.9 (unable to add other players to the favorites). Thanks for reporting. Not specifying a name now means that your account name will be used for further actions. The 3 new houses have been added. The house list is sorted by name now. Bug Fix: Keybindings didn't work when there were more than 10 favorites. Awesome, I really appreciate you taking the time to respond. I'm also curious about something that would allow you to sort guildies by zone, not necessarily their homes. Currently, I'm going through guild 1-5, searching each list for people in the right zones, and then of course it's a gamble about which wayshrine they are nearest in that zone, so it's an additional loading screen if I'm unlucky. I have the guild rosters sorted by zone and hiding offline members, but I think it would be super if there was an addon that could do this for me. For example, it would show all online guildies from all guilds and be a long list like the roster, sortable by zone. I don't know if you can get info on which wayshrine they are nearest to, so I'm not sure if that would be possible. I think this is the most dailies I've ever done, and while I really really appreciate the 'port to guild member' feature, I think there are better ways to arrange that information that would make it easier to do things like this. Again, I could be way off base, but I'd like to find out what you think of this. Edit: I did find two addons that might let me do this. The first is Teleport Tool (out of date and possibly not functioning well) and Faster Travel. I'm going to see how Faster Travel works out, but I'd still love it if it could all be condensed to one addon, as I have way too many already and LUA errors slow me down but some addons (even out of date ones) are indispensable. I also use Easy Travel. You can then teleport to a zone (if someone in your guilds or friends list is there) or directly to a player. Last edited by wolfstar : 10/20/18 at 04:12 PM. 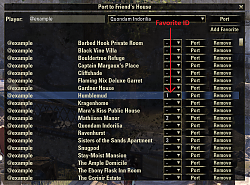 Is it at all possible to add a feature where you can sort guildies and/or friends by the zone of their homes? It would be a lot faster for my purposes. For example, I'm doing these dailies for Cyrodilic Collections and trying to find a guild in which a member is in the correct zone so I can transfer to them for free. Does the API allow for a feature to be added that allows all guild members to be an option in PTF and sorts their homes according to zone? That's probably a whole lot to ask and I've no idea how to code, so forgive me if I'm way off base, I just thought something like that would be awesome. 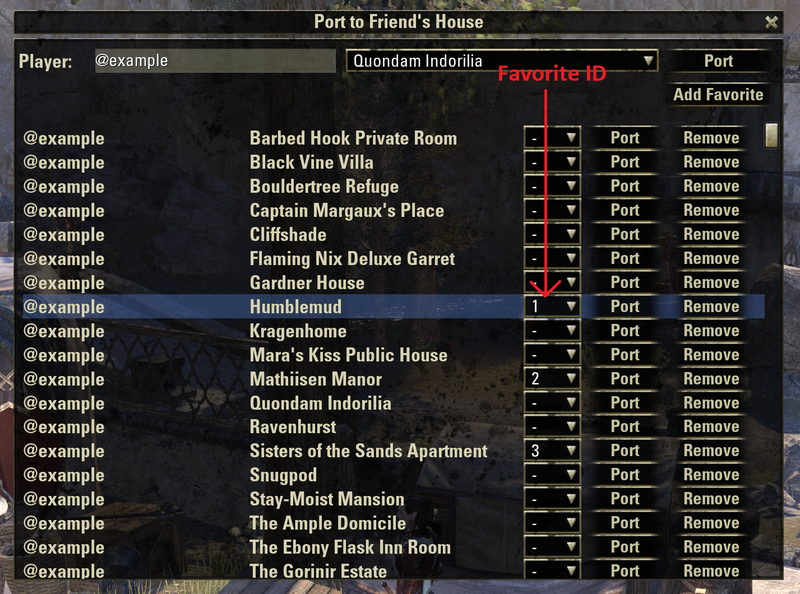 Unfortunately, as far as I know (would have to check if ZOS added more functionality), it isn't possible to get information of other players houses. If you know the house a player owns, you can port to it. Otherwise, there isn't a function to get that information (unless you are currently in that specific house). Edit: As a little side note: I hope that i will find a bit of time this year to add a few more features and fix a few things. If all works out as I hope, i'll take a look at the API again to verify if this is possible now. The goal of port to friend's house is to provide a way to access the houses people own as there is currently no in-game method to achieve this. It wasn't intended to use it as a fast travel tool as you'll get one additional loading screen and the loading screens when porting to houses can be rather long. Therefore, adding the functionality of a fast travel tool is currently not intended. Maybe in the long run, but there are currently more important features to implement (and i'm currently lacking the time to implement them already). I haven't used it myself, but a guild mate recommended it. If you receive any LUA error messages regarding port to friend's house please let me know, so i can fix it. If you get LUA errors from other addons you might consider No, thank you. It will convert error message to notifications. So you can still inspect the cause of the error, yet you do not get spammed by error messages. Last edited by VeronicaStormborn : 10/17/18 at 10:35 AM. Last edited by Sordrak : 10/17/18 at 12:38 AM. Had to do a fresh install. Not sure why. Guess something didn't overwrite when I updated last. Hello, it looks like Hunter's Glade and the Grand Psijic Villa have to be added to the addon. I'm unable to visit people who don't have it as their primary or aren't there. Update the version and if the issue still persists please let me know which version you are using and what your client language is set to. I would really love to add notes to the stored addresses of the houses of my friends. An example are the notes in the guild roaster. If it could be possible to show the name of the homes edited by the owners, this would be helpfull too. Anyway this is a great addon, thanks for your good work! Thanks for the feedback. The comment functionality is on my ToDo list. Unfortunately, it is there for quite a while now and chances are that it will take a few months before i have the time to implement it (it would also be part of the visit cards and so on - quite a bit of work). Regarding the home names. I'm not aware of this functionality in the game. Are you using another addon to change those names or could you describe how it is done? I'm glad to hear that the notes are on you're ToDo list. I think it's a build in possibility in the game - but I will try later without addons to be sure - I can rename my houses like pets, I don't know where the renamed names are shown, other players saw the originial name of the house after renaming it by visiting me in my house. If it is really build in and if there is an api-method to fetch the changed name, you could show it (optionally) in your addon. Edit: I searched a little bit at https://wiki.esoui.com/API but did not find any method that sounds like returning the changed names. Edit 2: To rename a house: Press U for Collections, select the second rightmost icon (the house). At the bottom are two buttons, one to travel to the house (left) an another to rename it (right). well, i have no idea what the API offers here. I know that when I implemented the first version i wasn't able to retrieve a list of existing house names and i had (and still have) to create that list on my own. If I find an API call which returns the renamed house name I'll add this in a future update. But then again, it most likely will take quite a while as i am busy with other things. Last edited by Aliisa : 09/14/18 at 08:01 AM. Last edited by Aliisa : 09/13/18 at 05:32 AM. It would be really nice to have a running total of visitors. I am not sure if this is possible. Delineating between unique visits and all visits would be super awesome icing on the cake. I took a short look at the API and didn't find anything that would help for such a feature. It is possible to get the number of people in house but not who is currently in the house (as far as I've seen). In the best case it would be possible to add people to a list of previous visitors that you had in your target while they were in your house, but that doesn't seem to be what you want. So currently it doesn't seem to be possible to properly implement that feature. But you may post this as a feature request for ZOS. With a lot of luck they may add something like that. Hi there, i cant find in the list Nibenese Manor buddy, i can't teleport to my friend house. I took a look at the list and the currently available houses (incl. crown store). I can't find a house with the name you are looking for. Is it already in the game or on the PTS? Do you mean the "Linchal Grand Manor"? It has the nibenese style. But that manor is already in the list. That is the Linchal Grand Manor and it is part of ptf. Which language are you using?